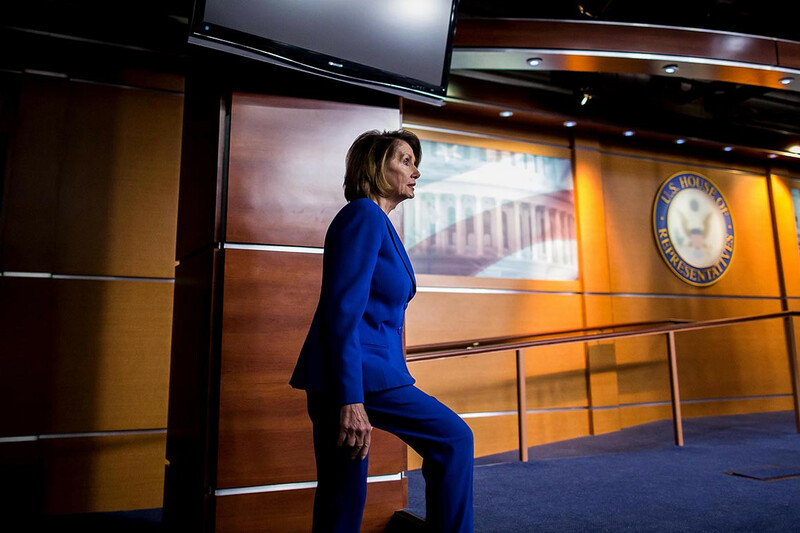 Speaker Nancy Pelosi has another rebellion in her ranks. And there’s no easy way to quash it. House Democrats have repeatedly faced surprise Republican floor attacks since taking control of the chamber, part of a bid by the GOP to target their most vulnerable members and fracture the party. Just six weeks in, the GOP effort has been an astonishing success — dividing Pelosi and her top deputies and pitting members of the freshmen class against each other. At issue is a wonky procedural tactic that Republicans have weaponized to split Democrats on a range of thorny issues, from sexual abuse to anti-terrorism funding. Roughly two dozen Democrats have so far bucked their party and sided with Republicans on the votes. As the GOP continues to peel off rank-and-file Democrats, party leaders have grown alarmed — and are increasingly engaged in finger-pointing about who is to blame for the disunity and what to do about it, according to interviews with nearly two dozen Democratic lawmakers and aides. Freshmen Democrats in swing districts say they have no plan to stop voting with the GOP when they feel the need. They’ve even been given the blessing to do so by House Majority Leader Steny Hoyer (D-Md.) and Majority Whip Jim Clyburn (D-S.C.), despite resistance from Pelosi. Other Democrats disagree, calling them “gotcha” tactics that only embolden Republicans to try to force Democrats to take uncomfortable votes that can be aired attack ads later. The defections also put pressure on other freshman Democrats who could be endangered but don’t want to defy leadership and vote against the party. Republicans have forced more than a dozen of these votes — known as a motion to recommit — on the House floor since January, with increasing numbers of Democrats voting for them each time. GOP leaders scored their biggest victory yet with the maneuver on Wednesday after a dramatic moment on the floor in which Democrats were forced to add language condemning anti-Semitism to an unrelated bill. Eager to project unity, all Democrats voted for it — the first time since 2010 a motion to recommit was approved by the House. Pelosi has previously met with the freshmen Democrats several times, encouraging them to stay united and vote with the rest of the caucus, just as Republicans did when they faced similar procedural arrows in the majority. She’s stressed repeatedly that the GOP’s votes are procedural and political, not intended to shape policy. But Hoyer and Clyburn have personally told freshmen they may side with Republicans, as long as Democrats don’t lose the overall vote — breaking a years-long precedent among party leaders in the majority. “My position has always been, if it does no harm, and members feel that’s a vote they need to cast, then it’s fine with me,” Clyburn said in an interview Wednesday. Hoyer, similarly, “believes members should vote their districts,” according to his spokeswoman. The procedural votes have been particularly vexing for Democrats in traditionally GOP seats. Leaders of the two centrist groups with the most vulnerable freshmen — the Blue Dogs and New Democrats — have encouraged their freshmen to vote how they feel rather than enforcing party unity, according to multiple sources. Hoyer and Clyburn huddled with several of those vulnerable members in mid-January and reiterated that same message — as long as enough lawmakers don’t vote with Republicans to actually approve the GOP-backed amendment. In that meeting Rep. Stephanie Murphy (D-Fla.), a leader of the Blue Dogs, was deputized as the liaison between endangered Democrats and leadership when it came to these votes. Since then, the topic has repeatedly come up at leadership meetings and on the House floor as lawmakers on both sides of the issue vent about the impasse and blame each other. Multiple sources privately pointed fingers at Clyburn, saying his whip operation wasn’t assembled in time to keep enough members in line when Republicans started pushing the votes in January. “Now you can’t put the toothpaste back in the tube,” said one Democratic source. Other members said the opposite, complaining privately that lawmakers on Clyburn’s whip team are too forceful in trying to pressure freshmen to change their votes and side with the majority. Democrats struggled with the same problem last time they were in the majority between 2007 and 2011 and had a cluster of vulnerable members in Republican-leaning districts to protect. The Democratic-led House approved the GOP’s procedural votes roughly one-fifth of the time during those years. But Democratic leaders are now worried that if one of the particularly prickly GOP amendments succeeds, it could sink whatever Democratic bill is on the floor, an embarrassing flop for the party in power. Several Democrats who have voted with Republicans on some of the motions said they feel like they’ve been thrown in the line of fire at a time when GOP political operatives are crafting their next attack ads in a push to retake the majority. But other Democrats complain that the members who vote the most with Republicans are doing so just to lower the overall percentage that they vote with Democratic leaders, hoping it will lessen GOP abilities to attack them as partisan in 2020. “I just vote for what’s best for my district,” said Rep. Conor Lamb (D-Pa.), a freshmen who frequently supports the GOP procedural votes. Some long-time Democrats say they’re frustrated that freshmen aren’t expected to stick with the party. “The truth of the matter, there are a bunch of freshmen, who have determined for whatever reason, that they’re always going to take the safe vote,” said Louisiana Rep. Cedric Richmond, a senior member of the Democratic whip team. Democrats’ approach to letting some members loose has created new opportunities for the House GOP leadership, which has a team of staffers tasked with targeting their opponent’s vulnerabilities in each bill that hits the floor. House Republicans, under the leadership of Minority Leader Kevin McCarthy of California, have designed the measures to be as politically painful as possible for Democrats. One amendment would have banned pay increases for federal workers who have been disciplined for sexual misconduct. Another would have forced veterans’ child care centers to suspend any workers who have been accused of drug-related or violent crimes. McCarthy and his top deputies couldn’t believe their luck Wednesday when they succeeded with one of their procedural votes and forced Democrats to again confront the controversy surrounding Rep. Ilhan Omar’s (D-Minn.) tweets on U.S.-Israel policy. Meanwhile, Democrats complained, all but 18 Republicans turned around and voted against the underlying bill cutting off aid to Saudi Arabia in Yemen’s civil war — further proof, they say, that the votes are purely partisan messaging tools. Wednesday’s vote had GOP lawmakers and aides salivating at what they saw as a huge victory in an institution where the minority has almost no power. Republicans never once lost such a procedural vote when they were in the majority. Laura Barrón-López and John Bresnahan contributed to this report.